Walk the pebbled Zen garden as it leads you to the foyer at the lovely Villa Gwenn on St. Thomas. The stunning five-bedroom villa dressed in pristine white is a magnificent island getaway. 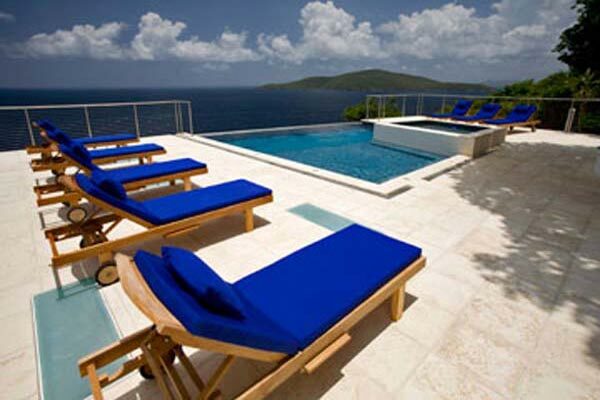 This deluxe St. Thomas villa is perfectly situated on Peterborg Estate. Here tranquility will drench you in the beauty of the islands, while you remain close to all the excitement of St. Thomas. Villa Gwenn is stunningly decorated in gleaming white wit h popping accents of art adorning the pristine walls. Clean and modern, this St. Thomas v illa is a model of contemporary style. The ocean sweeps across the backdrop from Villa Gwenn, creating an incredible vista that will steal your breath away and capture your heart. Each of the five bedrooms is immaculate, making this the ideal escape for large families or friends. The Great Room in decorated in white with nautical flair, creating a wonderful space to gather. Bask out in the sun on the coral-stone terrace and enjoy the sparkling pool in the beauty of a clear Caribbean day. Private and chic, this St. Thomas villa is an exquisite escape. Discover the island of St. Thomas, from the magnificent restaurants to the world-famous Mahogany Run Golf Course to the top-notch shopping. All this and more is here to enjoy on the island of St. Thomas.